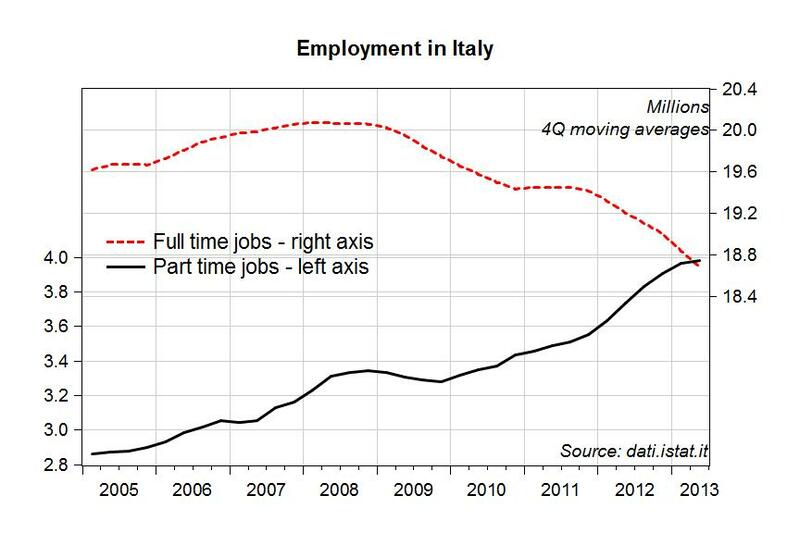 Are Structural Reforms the Cure for Southern Europe? It is essential to realise that if the European authorities continue with policies of austerity and rely on structural reforms alone to restore balance, the fate of the euro will be sealed. The Economists’ Warning was published by the Financial Times (“European governments repeat mistakes of the Treaty of Versailles,” September 23), and a reply by Professor Gilbert of the University of Trento appeared in the Letters section on September 25. Professor Gilbert seemed to imply that the Economists’ Warning was advocating external support for Southern European countries in trouble — a position that is not apparent in the original document, which only advocated “concerted action” among eurozone members. My reply to Professor Gilbert was published late last week in the Letters section of the Financial Times. 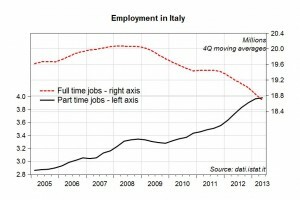 I argue that structural reforms have already been implemented in Italy: such reforms aimed at cutting pension payments to generate a structural reduction in the government deficit (matched of course by a reduction in the purchasing power of people in retirement) and increasing flexibility in the labor market. The chart below documents the dramatic drop in employment since 2007 — almost one million jobs, with a fall in full-time positions of 1.77 million partially compensated by 813,000 new part-time positions. In a recent report on Greece we have argued along similar lines: structural reforms and austerity have pushed the unemployment rate to unprecedented levels, and increased competitiveness achieved through lower labor costs has done (and will do) little to improve the external balance, while it has contributed to a dramatic drop in domestic demand. Professor Gilbert responded to my letter in the Comments section of the Financial Times, and since I hope this discussion could be of interest to others (the Letters section of the FT is only open to subscribers), I would suggest continuing it on this blog. 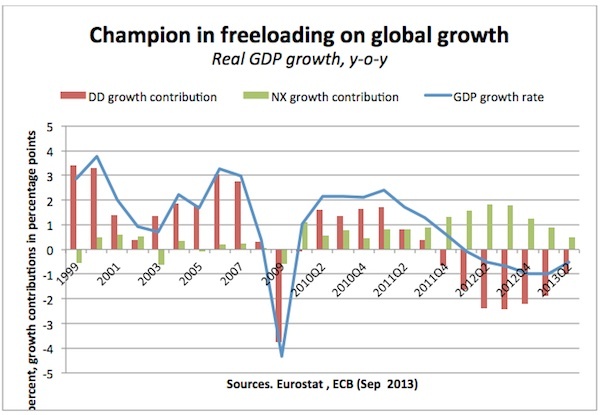 Euroland’s “Recovery” – Three Cheers for Dr Schäuble! Never miss a party – especially one you’ve been desperately waiting for for so long. This much the authorities in Europe’s currency union clearly understand. As soon as Eurostat had released its first estimate for GDP growth in the spring quarter in mid August (1st estimate here), which was missing the by now customary negative sign, the champagne began to flow, it seems, accompanying all-round self-congratulatory shoulder slapping. For instance, Spain’s economy minister Luis de Guindos confidently noted that “Spain will show clearly the quality of the policies implemented in the eurozone” (FT.com 4 September 2013). And European Commission President José Manuel Barroso declared in his State of the Union Address on 11 September 2013 that “the facts tell us that our efforts have started to convince.” Germany’s finance minister Wolfgang Schäuble also joined the chorus, just in time for the federal election, proudly announcing in The Financial Times that “while the crisis continues to reverberate, the eurozone is clearly on the mend both structurally and cyclically.” Dr Schäuble declared with poise that “what is happening turns out to be pretty much what the proponents of Europe’s cool-headed crisis management predicted. The fiscal and structural repair work is paying off, laying the foundations for sustainable growth,” and then went on to boast that “despite what the critics of the European crisis management would have us believe, we live in the real world, not in a parallel universe where well-established economic principles no longer apply” (“Ignore the doomsayers: Europe is being fixed,” FT.com 16 September 2013; see comment by this author: “The euro crisis is not even close to being over, Mr Schäuble”). Apparently Germany’s “stability-oriented” prescriptions for the land of the euro are now doing their magic just as Dr Schäuble had always promised they would. Fiscal contractions are now proving expansionary after all, just with a little bit of a delay, while growth-enhancing structural reforms are beginning to bear fruit too, it seems. The euro authorities are making sure though not to miss any chance at emphasizing that more of the same medicine will be needed to do even more good going forward. Does the Fed Have the Tools to Achieve its Dual Mandate? Stephanie Kelton recently sat down with L. Randall Wray to discuss, among other things, the news that the Federal Reserve will refrain for the time being from tapering its asset purchases (QE). Wray took the occasion to elaborate on his view that quantitative easing is ineffective as economic stimulus and that — given the tools at its disposal — the Fed can’t actually carry out its dual mandate (on employment and price stability). One interesting wrinkle here is that Wray makes this case not just with regard to asset purchases — which even some QE supporters have admitted don’t accomplish much in and of themselves — but also the “expectations channel” (forward guidance). Kelton and Wray also touch on the latest debt ceiling showdown and the future of retirement security programs. In this simplified setting, the constant known as the “money multiplier” becomes the “credit divisor,” a concept defined in a short article I wrote recently for the forthcoming Elgar volume Encyclopedia of Central Banking. The equation reflects a theory in which causality runs from left to right, reflecting the endogeneity of reserves. Indeed, the divisor is far more realistic as a model of the money-creation process than the money multiplier. The collapsing money multiplier in the figure in Dolan’s post corresponds to a rapidly rising credit divisor. The post also points out that after loan demand, “the second constraint is bank capital.” The post notes that when this constraint is binding, the idea of a “reserve constraint” is still more irrelevant. Also, a profitable and solvent bank that wishes to expand its lending can usually increase its capital by retaining earnings or by other moves, as Marc Lavoie and others have pointed out in the academic literature. Moreover, Lavoie observes that a commercial bank having difficulty raising capital might be able get the central bank to purchase its shares in some countries. Lavoie’s account can be found in his fairly comprehensive essay, “A Primer on Endogenous Money,” in Modern Theories of Money, edited by Louis-Philippe Rochon and Sergio Rossi, Edward Elgar, 2003. From a policy perspective, a fast-growing stock of money is not generally a “cause” of inflation, though it can be an effect of rising prices or economic activity. (Of course, interest rates that were low enough long enough could cause inflation in a situation in which there was a lack of unused productive capacity.) Central banks cannot fix the growth rate of money to achieve a desired inflation rate, by setting the growth rate of bank reserves. For, as the concept of the credit divisor illustrates, the latter are also endogenous in a modern banking system. The following table has been computed using data from the latest (April 2013) IMF World Economic Outlook database, with IMF estimates starting in 2013 for most countries. In my view, these projections are based on heroic assumptions and wishful thinking. The eurozone is supposed to improve its position, even though the current account balance of Germany is supposed to drop substantially (from 1.52 percent of US GDP in 2012 to 0.93 percent in 2018): Greece, Italy, Portugal, and Spain are all supposed to move from a current account deficit in 2012 to a surplus from 2013 onwards, and France is also supposed to reduce its current account deficit. It therefore seems that the IMF is assuming some equilibrating process inside the eurozone, but overall this area will either be importing less from abroad (while keeping its exports constant) or exporting more. In the former case, the eurozone will impart a deflationary impulse to its trading partners. In the latter case, which area is supposed to absorb the additional eurozone exports? Looking at the table, the candidates are either the United States, which is projected to see its current account deteriorate even further, or developing countries. If export-led growth from China – the only country in the BRICs for which the IMF projects an improvement in its current account – and the eurozone must rely on additional demand from developing countries, plausibly out of borrowing, global imbalances will trigger a new round of financial instability worldwide. The other puzzling feature in IMF projections is the substantial fall in the current account of OPEC countries. Is the IMF hoping for a permanent shift of the world economy away from oil products, and therefore a fall in the price of oil? If this is the case, I would expect a fall in the US current account deficit, rather than an increase. But given the permanent turmoil in the Middle East, hoping for a consistent drop in the price of oil may be wishful thinking. [F]ederal spending will rise from 22 percent of GDP in 2012 to 26 percent in 2038 … The deficit [currently 3.9 percent of GDP] would be 6.5 percent of GDP in 2038, greater than any year between 1947 and 2008 … Even though tax receipts would grow …, the revenue increase wouldn’t be “large enough to keep federal debt” from “growing faster than the economy starting in the next several years,” according to the CBO report. Here’s another way of presenting those CBO numbers. Spending on actual government programs is projected to fall from its current 19.5 percent of GDP to 18.8 percent in 2023, before rising to 21.3 percent in 2038. And revenues are also projected to rise, from 17 percent to 19.7 percent of GDP by 2038. The result, according to the CBO, is that the primary budget balance (that is, excluding interest payments) shrinks from its current level of -2.5 percent of GDP to -0.3 percent in 2023, and then grows to -1.6 percent of GDP by 2038. Nonetheless, the CBO’s extended baseline tells us that debt will rise from its current 73 percent of GDP to 100 percent of GDP by 2038. The key here is the interest payments — CBO’s prediction of rising interest rates over the long term (and the near term, for that matter). What this means, as James Galbraith explained in this policy note, is that if the rate of interest on government debt (r) is above the rate of economic growth (g), then any primary budget deficit will lead to an “unsustainable” path for the debt over the long term — in the narrow sense that the debt-to-GDP ratio will rise without limit. 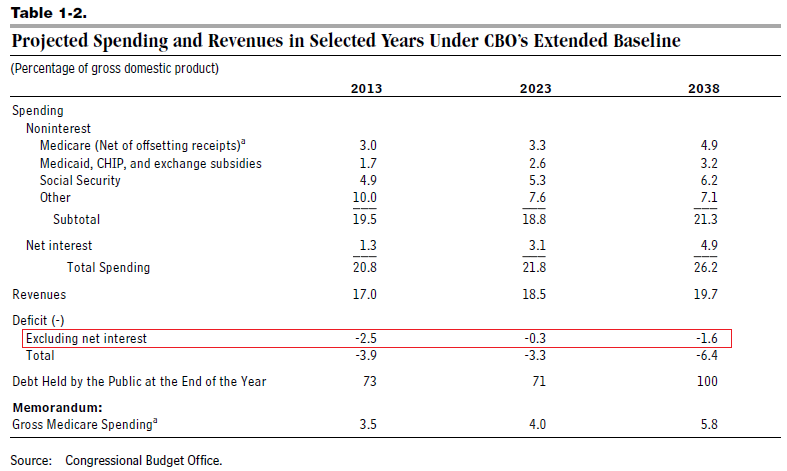 By contrast, if r is below g, then even what would normally be considered a “large” budget deficit (Galbraith uses the example of a continuous primary deficit of 5 percent of GDP — well above what CBO is projecting over the next few decades) will be “sustainable” over the long term, in the sense that debt will eventually stabilize as a percentage of GDP. 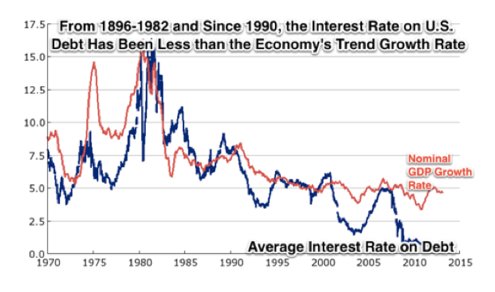 For most of the postwar history of the United States, with the exception of the 1980s and part of the ’90s, the rate of interest on government debt has tended to be below the rate of economic growth. Underlying the CBO’s projection of an ever-rising debt ratio is its assumption that over the next few decades, that will no longer be the case; that for some reason, the exception of the 1980s will become the rule. The Euro: Can’t Live With It … ? As a member of the eurozone, Greece does not control its own currency and therefore cannot devalue said currency in an effort to promote an export-led recovery. Instead, Greece is stuck with the troika’s strategy of internal devaluation: seeking export growth through reducing unit labor costs (wages). As Dimitri Papadimitriou, Michalis Nikiforos, and Gennaro Zezza have pointed out, however, that strategy isn’t working (pdf). You can argue, I suppose, that without the devaluations export performance would have been even worse. But you cannot claim that faster export growth following the devaluations boosted demand, because no such faster growth occurred. It’s really remarkable how much the devaluation-export growth link is taken for granted in discussions of foreign trade. But in the real world, for whatever reason, the link is often weak or nonexistent. If that’s the case, Greece may truly be stuck — that is, without a major, and wildly unlikely, intellectual conversion within the ranks of troika and core country leadership; one that leads to an abandonment of austerity and more imaginative thinking about how to use funds from European institutions to stimulate growth and employment in the periphery. In case you missed it, what with all the celebrating going on in the eurozone over the incredible success of austerity policies, the unemployment rate in Greece is now at 27.9 percent and the country is likely on its way to a third bailout. “At this stage, in order for Greece to be able to service its debt and recapture its lost GDP and employment levels, one would have to rely on an outrageously optimistic scenario of economic growth: probably somewhere in the range of a long-term nominal GDP growth rate of 7–8 percent. Back in 2009, Janet Yellen delivered a speech at the Levy Institute’s Minsky conference that explained how the financial crisis had changed her views about the role of central banks in handling financial instability. At the time she was the head of the San Francisco Fed. The focus of her 2009 remarks was the question of how (or whether) central banks should try to counteract bubbles in asset markets. (Yellen also recalled the unfortunate topic of her 1996 conference speech: supposedly promising new innovations in the financial industry for better measurement and management of risk.) Bursting suspected bubbles has become the topic du jour in US monetary policy discussions, as it currently stands as the fashionable justification for tightening despite low inflation and high unemployment. It’s a great pleasure to speak to this distinguished group at a conference that’s named for Hyman Minsky. My last talk at the Levy Institute was 13 years ago, when I served on the Fed’s Board of Governors, and my topic then was “The New Science of Credit Risk Management at Financial Institutions.” I described innovations that I expected to improve the measurement and management of risk. My talk today is titled “A Minsky Meltdown: Lessons for Central Bankers?” and I won’t dwell on the irony of that. Suffice it to say that with the financial world in turmoil, Minsky’s work has become required reading. It is getting the recognition it richly deserves. The dramatic events of the past year and a half are a classic case of the kind of systemic breakdown that he—and relatively few others—envisioned. A panic of unprecedented order has struck the crisis-ridden Indian economy. It brings to the fore the question of what led to this massive downturn, especially when the country was touted, not long back, as one of the high-growth emerging economies of Asia. A volte-face, from scenes of apparent stability marked by high GDP growth and a booming financial sector to a state of flux in the economy, can completely change the expectations of those who operate in the market, facing situations with an uncertain future. Such possible transformations were identified by Kindleberger in 1978 as a passage from manias, which generate positive expectations, to panics, which head toward a crisis. While manias help continue a boom in asset markets, they are sustained by using finance to hedge and even speculate in the asset market, as Minsky pointed out in 1986. However, asset-market bubbles generated in the process eventually turn out to be on shaky ground, especially when the financial deals rely on short-run speculation rather than on the prospects of long-term investments in real terms. With asset-price bubbles continuing for some time under the influence of what Shiller described in 2009 as irrational exuberance, and also with access to liquidity in liberalised credit markets, unrealistic expectations of the future, under uncertainty, sow the seeds for an unstable order. The above leads to Ponzi deals, argues Minsky, with the rising liabilities on outstanding debt no longer met, even with new borrowing, since borrowers are nearing insolvency. Such situations trigger panics for private agents in the market, who fear a possible crisis situation. These are orchestrated with herd instincts or animal spirits in the market, as held by Keynes in 1936. In the absence of actions to counter the market forces, a possible crisis finally pulls down what in hindsight looks like a house of cards! Indeed, when markets have the freedom to choose the path of reckless short-run financial investments, with high risks and high returns, the individual’s profit calculus eventually proves wrong in the aggregate, leading to a path of downturn; not just for the financial market, but for the economy as a whole. This is how manias lead to panics and then to crisis in an economy.